Greetings Bot Builders. Season 2 is on and we couldn’t be more excited. Below you will find the Season 2 Design Rules. The Season 2 entry period is now closed, but if you are considering designing a robot for Season 3 (if ABC gives us the green-light) you may download and study the Season 2 rules to better understand what you can and can not design. Of course there will be modifications to the Season 3 rules, but the majority of regulations should stay the same. 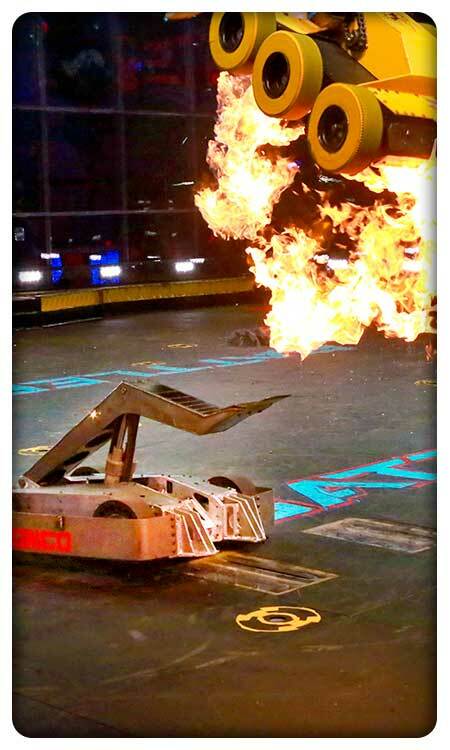 If you have any question please email us at rules(at)battlebots.com. The Season 2 entry period is closed, however we have decided to leave our application system up and running for builders interested in designing a robot for Season 3 (if ABC gives us the green-light). If this is you, click over to the Online Application System and start working on your entry. We’ll review all new applications once the Season 3 details have been announced. This document outlines the requirements for any Team that intends to build a combat robot and compete in the 2016 BattleBots Tournament. This document defines and describes the 2016 BattleBots Tournament terminology, activities and procedures. It also specifies the required actions and responsibilities of Teams participating in the Tournament. This document outlines the rules regarding minors (persons under the age of 18) participating in the 2016 BattleBots Tournament.